Clergy from all over the region are supporting new legislation aimed at lowering the cost of prescription medicine. The bill establishes an affordability board that will set payment rates. According to the bill’s sponsors, prescription drug prices are increasing 10 percent a year. This proposal creates a board with the authority to set rates similar to what utility companies go through. Prescription drug sticker shock was a tragic and expensive experience for Jessica Gorski. Her husband and daughter have a genetic disorder. “Prescription drugs have taken our college funds, have taken our retirement funds, have taken everything we have in order to save my husband and daughter’s lives,” Gorski said. Jo Saint-George is a lawyer with the National Association for the Advancement of Colored People. Medicine she needed for a brain tumor wiped out her finances. Legislation to control the cost of medicine is getting a boost from clergy across the state. “An epidemic has gripped this country for far too long and the name of the disease is greed,” said Rev. Ken Phelps of All Saints Episcopal Church. Brand names that enter the market at $30,000 or more a year. Existing brand names that increase in price by $3,000 or more per year or during the course of treatment. Generic medications that increase by $300 or more a year. Gov. Larry Hogan agrees prescription drug costs are out of control. 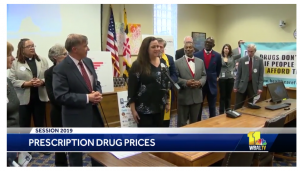 “I think we need to take a look at making prescription drugs more affordable and we are going to work with the legislature to take a look at whatever legislation they are proposing,” Hogan said. Despite 98 co-sponsors in the House alone, the bill has an uncertain future because it faces fierce opposition from the pharmaceutical industry.